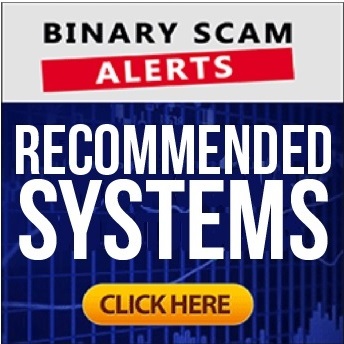 Binary Scam Alerts » Scam Reviews » Wealthy Trader Review, Scam Wealthy Trader Software Exposed! The new Wealthy Trader software and trading robot by Nelson Roosen (not to be confused with Wealthy Wheat Trader) is a filthy scam, and we rightfully blacklisted it in our fair and transparent review and investigation. This is a classic get-rich-quick scheme, and you are being targeted by greedy affiliate marketers looking to cash in on your financial hardships. Don’t allow yourself to get suckered into this fraud network, because you will surely end up having your money stolen by offshore brokers conspiring against you with online promoters. For your information, these crooks usually use SPAM email marketing as their preferred baiting tactic, so please don’t click on any links and if you can try to unsubscribe from receiving further communication. Believe it or not, there’s nothing legit or genuine about this fake app and auto trader and that is an indisputable fact which we will prove to you with hard evidence our staff has produced. Keep reading to see how we exposed the deceptive and misleading Wealthy Trader, and why we now know it is a confirmed financial scam. Below you will find a screenshot taken directly from the Wealthy Trader main sales page. In it you will clearly see how one of the “beta testers” swears this software has completely “transformed his life” and now all his financial worries are a thing of the past. Right next to it you will see an image of a Fiverr.com actor named riverman who sells his services for a measly $5. 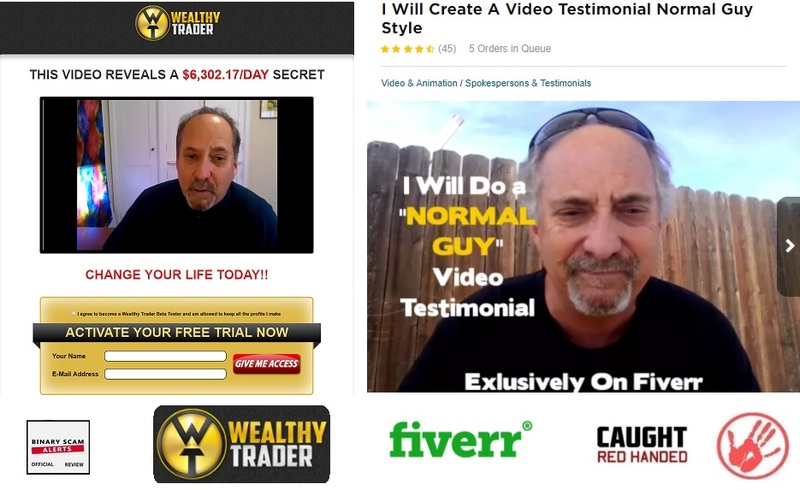 If you take a closer look you will see he says that he “will do a normal guy video testimonial”, and that’s more or less the only thing I believe here. Moving forward, below is an image of Roosen’s bank account, which reflects a balance of $1,173,018.23. This bank account does not exist and it has been photo shopped in order to show a falsified bank statement so you can believe he is rich. In reality the only bank account is your’s, and if you jump on this band wagon it will be wiped out very quickly by thieving offshore brokers who care nothing about your financial welfare and want to defraud you as fast as humanly possible. 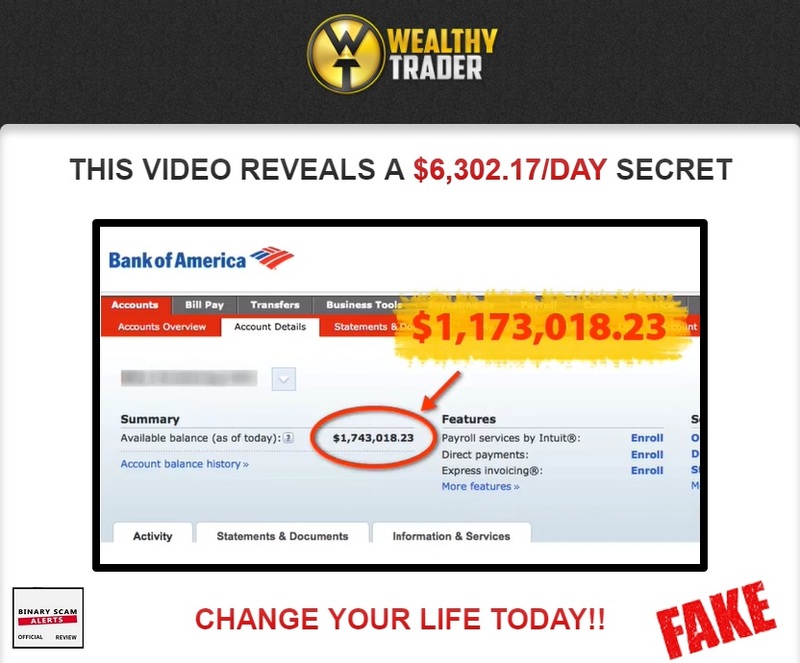 Wealthy Trader Software Review – $2,000 A Day? Have you ever had $1 Million Dollars just sitting in your bank account? That’s how the sales video starts, and immediately they go for the hard-sell and show you inflated bank accounts followed by fake testimonials and tons of hyped-up and exaggerated claims of easy money. The video is supposed to be “strictly for money makers” and will help you reach financial independence within the shortest amount of time. A constant stream of profits which operates on auto-pilot and generates passive income while you live your life and do the things you love. The app is supposed to be for professionals as well as amateurs just starting out and shows you how to turn unstable market conditions to your advantage. Roosen claims Binary Options offer profits as fast as 60 seconds and has the lowest risk to your capital. He was actually never in any newspapers, and all mentions of him wreak of scam. He is a fictional character who claims he does not conform to society’s norms and plays by his own rules. He claims his father was a factory worker who worked all his life until he passed away. He’s known as the Wealthy Trader because after he graduated from college he joined one of the leading Wall Street brokerage firms and quickly rose through the ranks by using his own software. He then realized binary options are the most profitable and fastest way to make money, so he focused on that and automated his systems so they are no operating in a hands-free manner. He is the sole proprietor of a binary options software, which he named after himself – the Wealthy Trader. Well, it’s possible but not with this software. We have all the classic tell signs which include massively inflated and forged bank accounts, tons of hype, fake testimonials, and just outright lies and fabrications. The narrative is so old and rehashed that it screams plagiarism, cheating, and half truths. No, it is not. $250 is the minimum amount of money it will cost you to buy into this filthy app. That money will be charged to your credit card by conniving offshore brokers who will gladly overcharge your credit card if you just give them your details. Yes, we have some of those although not much. The fake review sites have been totally rebuked and discredited for endorsing Wealthy Trader (and with good reason). We already know they accept bribes in the form of commissions for referring traders. If you are deliberating and not quite sure on which system is best for you then you are not alone. Our staff of diligent researchers has done all the work so you don’t have to. Our recommended section offers a short list of consistent money-making apps and we don’t change them too often since most of the new ones prove to be worthless and are not to be trusted. The Wealthy Trader software and automated trading solution (AKA robot) by Nelson Roosen is a verified investment SCAM, and we had no choice but to blacklist it in our detailed review. We are fed up with these schemes, and would like the con artists to cease from promoting them. We are constantly searching the internet for genuine trading apps, however Wealthy Trader is an example of the exact opposite of what we are looking for. To make matters worse, we also have it from a trusted source that the people pulling the string behind this sham are dubious characters with a criminal background and a knack for stealing money. Never divulge your credit card information as these thieves specialize in credit card fraud and identity theft. In light of all the incriminating evidence our staff has produced, we are blacklisting this shameless app and advising our members and viewers to seek alternative investment channels. Our Facebook Page and YouTube channel is her for you so don’t forget to join and subscribe.